Nothing says “I’m a humble cook” like shouting really loudly that this is the best recipe you’ll ever eat! My bad. What can I say? There’s bacon in it. And cream cheese. The goodness of this recipes has nothing to do with me, and everything to do with the amazing mixture of ingredients all rolled up in a tortilla. This recipe is so easy that my kids made it on their own for our family to eat on Mother’s Day. 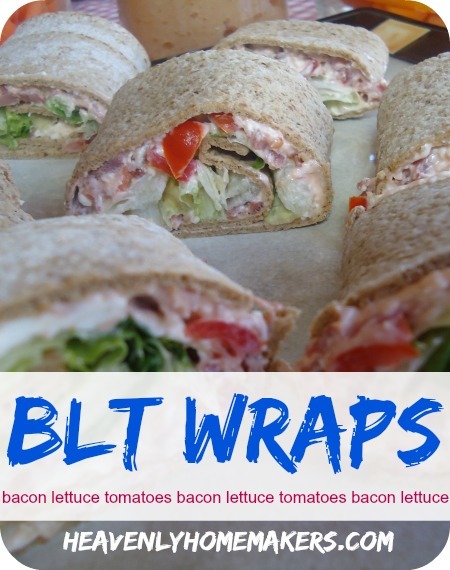 These can be made ahead of time – or at the very least, you can cook the bacon and prepare the tomatoes and lettuce so that you can put them together right before serving time. The best part? Well…the bacon, duh. Yeah, but the other best part? These wraps really hit the spot on a hot day. There’s minimal cooking involved, so the house won’t heat up. Serve these with a variety of fresh fruit like pineapple, watermelon, or strawberries. Set out some sweet peppers, sliced cucumbers, and carrot sticks. What a wonderful, nourishing meal. Mix cream cheese and mayonnaise until smooth. Stir in bacon crumbles and chopped tomatoes. Sprinkle shredded lettuce on top evenly. Cut each into 5 diagonal slices. Tip: Make the cream cheese filling ahead of time and store it in the fridge. Then simply fill your tortillas at meal time, wrap, and serve! These work great for brunch, lunch, party, snack…pretty much any time. What a great recipe! Unfortunately, my husband does not care for fresh tomatoes. Do you think I could substitute roasted red peppers? Or would that be too overpowering? Sure, peppers would be a great addition, sweet or hot. :) I’ve left out the tomatoes entirely (without subbing anything else) for two of my kids who don’t like tomatoes and that works fine too. That sounds wonderful! My guys are going to love that one – anything with bacon in it. Dumb question here, but when you say slice diagonally, does that mean you shouldn’t cut them at a 90 degree angle to the roll? Do they turn out better that way? Thanks!! Sounds yummy, just add some avocado & it would be delicious. We ate these for lunch today and subbed hummus for the cream cheese/mayo combo (only because my son can’t eat dairy). Very tasty! We make these subbing salsa for the mayo, and add black beans for a “western wrap.” YUM!! I am curious how many this recipe would typically serve? I knew this would make a great “don’t want to heat he kitchen meal”. However no one in my family likes tomatoes so I ended up making a chicken, bacon, ranch wrap. It was yummy. I added ranch dressing mix to the cream cheese/mayo mix and some chopped chicken! Thanks for the inspiration! I pinned these a long time ago and finally made them tonight! They are yummy!